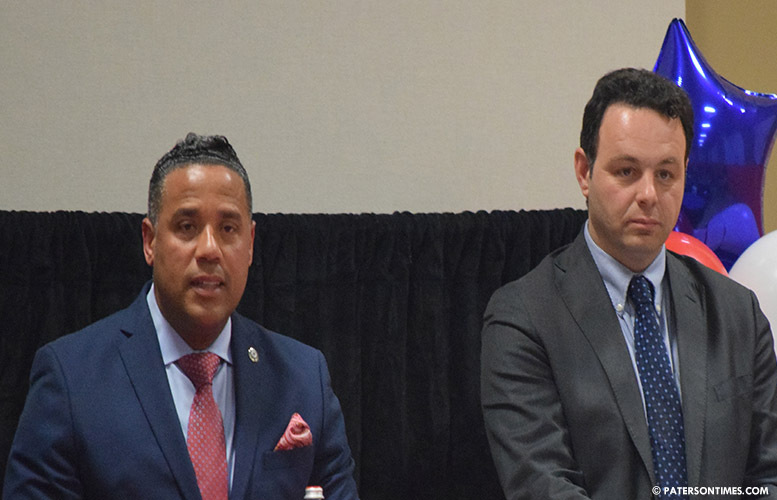 Andre Sayegh and Alex Mendez, each convinced the other is his main opponent in the six men mayoral race, exchanged fire at the City Hall debate on Monday afternoon. Sayegh struck first by calling out Mendez for his failure to file campaign finance reports on time. The state has yet to receive Mendez’s 29-day pre-election campaign finance report that was due two weeks ago. “You cannot talk about presenting a responsible budget when you cannot submit your ELEC report on time all the time,” said Sayegh. Mendez has always been slow in filing his campaign finance reports with the New Jersey Election Law Enforcement Commission (ELEC). After winning a council seat four years ago, he waited a full year before submitting the final campaign finance report. Mendez waited for his turn. He attacked Sayegh (pictured, right) for failing to take action against pastor Jesus Sevilla’s allegedly illegal garage church on Atlantic Street. “Maybe because this person is one of your biggest political supporter,” said Mendez to Sayegh. Sayegh said that issue is outside his ward. Sayegh represents the 6th Ward. The church is in the 2nd Ward. Shahin Khalique, 2nd Ward councilman, is behind Mendez. Khalique has been silent on the Atlantic Street church problem. Sayegh claimed Mendez voted against the business curfew ordinance that reduced non-fatal shootings in high crime areas by 79-percent. “If you had your way Paterson would be out of control. You are not fit to be mayor. And you are soft on public safety and crime,” said Sayegh. “Sure, that’s a good question,” said a flustered Mendez immediately following Sayegh’s biting attack. Mendez recovered. He held up a school district policy document and called Sayegh a liar for taking credit for championing a measure to force students to wear uniform to school. “He lied about the uniform policy,” said Mendez (pictured, left). Mendez said he was the first person to introduce the measure to force students to wear uniforms. Sayegh disagreed. “I did introduce the school uniform policy. How do I know? You came and sought advice from me,” said Sayegh. Mendez claimed Sayegh did nothing to create the building boom in South Paterson. “How can you say I did not have anything to do with it?” remarked Sayegh. Just last year, Sayegh was asked to emcee the ribbon cutting event for the South Paterson Plaza for assisting the developer in putting up the structure, he said. “You don’t have a record of results. So, you’re going to try to poke holes in mine,” said Sayegh. Mendez persisted and opened another front. He mentioned that developers and special interest groups were pouring money into Sayegh’s campaign. He asked Sayegh whether he will commit to make sure those groups will not be given jobs and contracts in a Sayegh administration. Sayegh said Mendez’s low standards is unfair to the other men in the race who file their campaign reports on time. Like Mendez, councilman William McKoy stepped on a land mine of his own, when he asked Sayegh and Mendez about the consequences that will befall the city if every council member voted against the budget. “I wouldn’t approve any increase. Unlike you, I’m not an automatic yes for any tax increase. You rubber stamped 15 tax increases much to the chagrin of taxpayers,” answered Sayegh. McKoy accused Sayegh of pontificating. He also thought the 6th Ward councilman failed to answer the question. Mendez said the only power he has against an irresponsible budget is his negative vote.